All Saints Church now: 2015, the site is now All Saints Park. 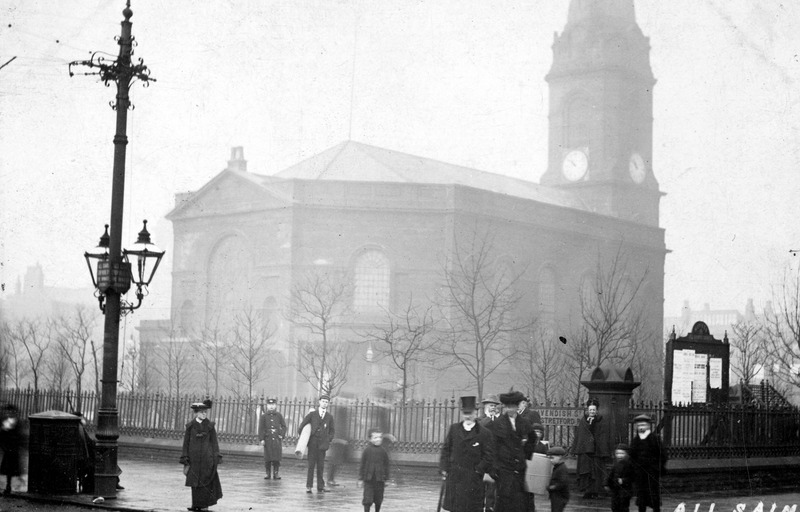 All Saints Church then: All Saints Church in 1900. Built in 1820, it was a C of E church. 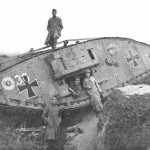 It sustained heavy damage in the Blitz and was demolished in 1949. Photo courtesy of Manchester Libraries, Information and Archives. 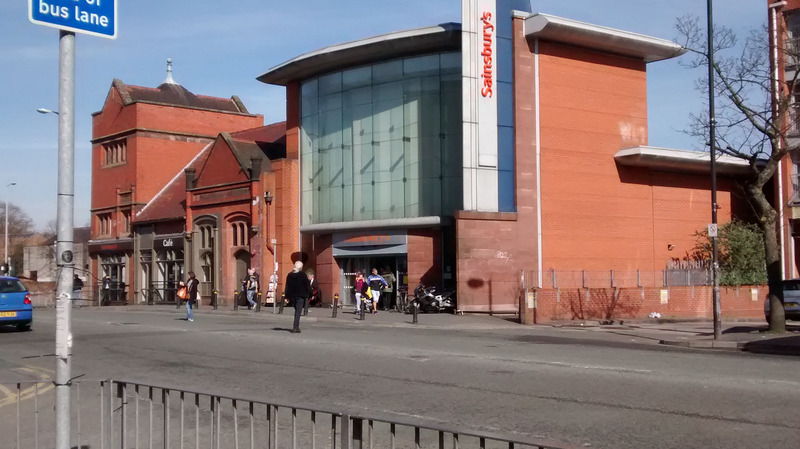 Fallowfield station now: Same site in 2015, now buried by Sainsburys and car park. 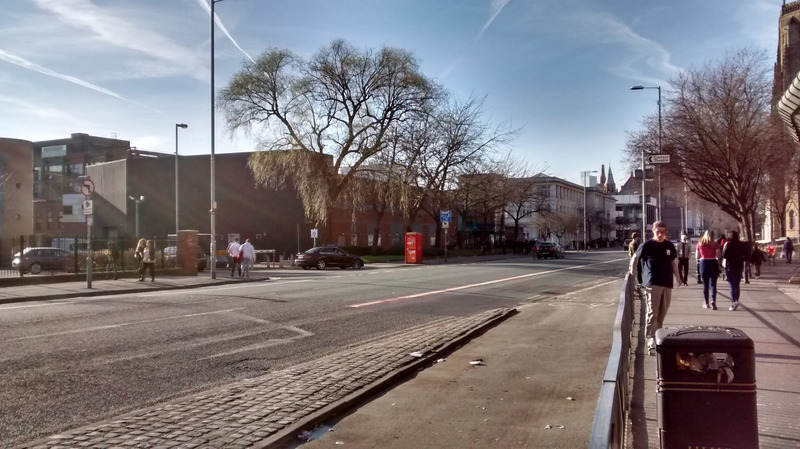 The old Fallowfield Loop is now a cycle route. Fallowfield station then: Fallowfield station in 1910, opened in 1891. Part of the Fallowfield Loop line. The station closed in 1958, and the line closed in 1988. Photo courtesy of Manchester Libraries, Information and Archives. 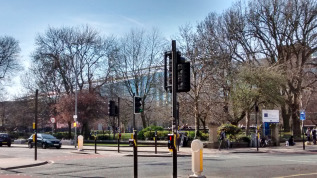 Oxford Road now: 2015, the area is a lot different, with only Whitworth Hall still standing. Even Ducie Street has changed, now Devas Street and much shortened by Contact theatre being built on top of it. Oxford road then: Oxford road in 1940. 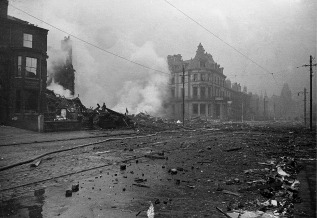 Heavy damage has been done to some buildings during the Manchester Blitz. 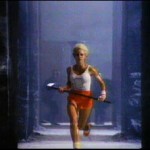 A lone fireman can be seen in front of the smoke. 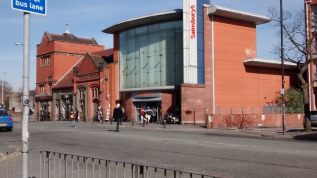 King’s Hotel on the corner of Ducie Street in the centre. 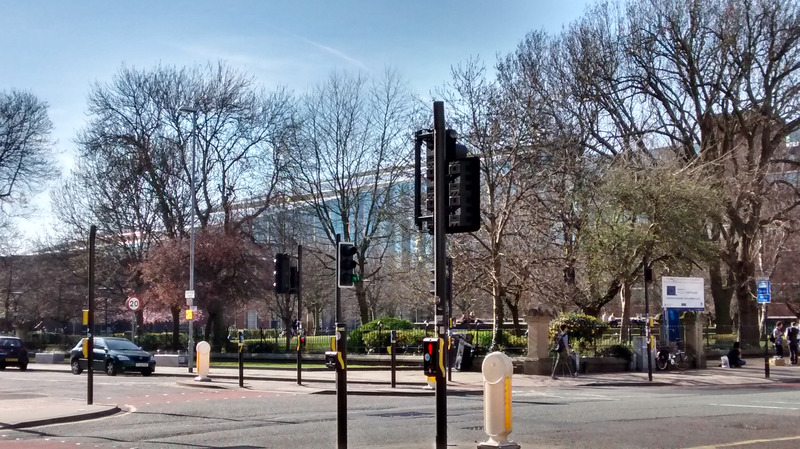 Whitworth Hall can be seen in the distance on the right. Photo courtesy of Greater Manchester Police Museum & Archives. Piccadilly then: Piccadilly in 1940. Massive damage has been done to warehouses and buildings in Piccadilly. 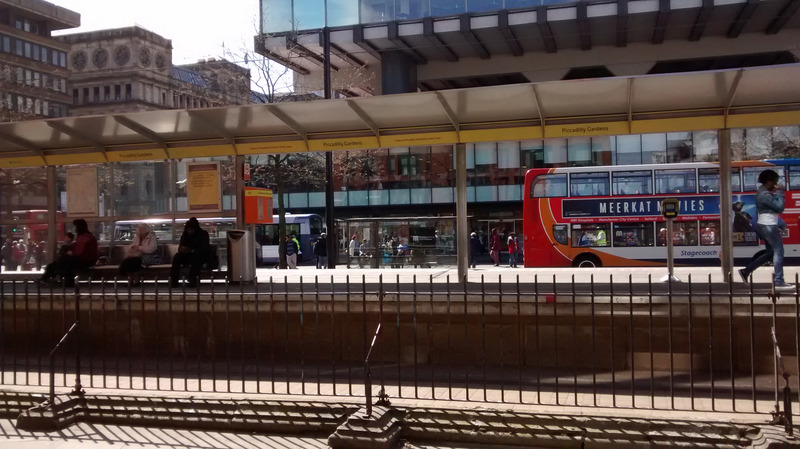 The bus shelter is one of the only things undamaged. The Grade II* listed Watts Warehouse can just be made out behind the building on fire on the left. Photo courtesy of Greater Manchester Police Museum & Archives. 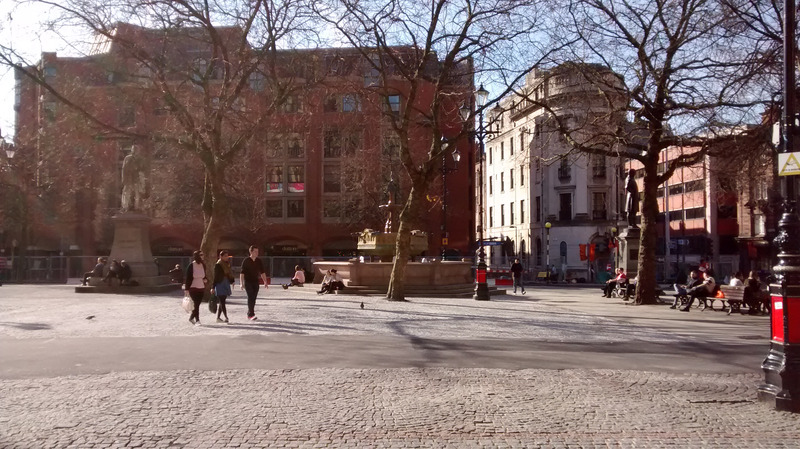 Piccadilly now: 2015, the entire area has been redeveloped after most warehouses became derelict and were demolished. The only things still standing are Watts Warehouse, and the fence in the foreground. Albert Square now: 2015, the site is pretty much the same, with only the buildings in the background being replaced, and the road in the foreground being pedestrianised. 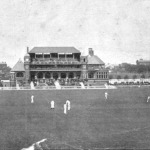 The temporary fountain was replaced by a permanent one in 1897 to celebrate Queen Victoria’s Diamond Jubilee. 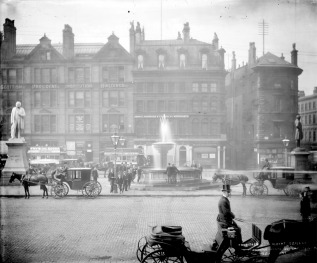 Albert Square then: Albert Square in 1895. 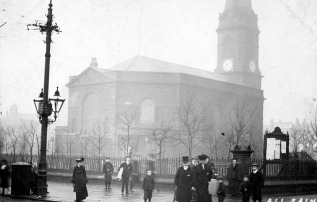 The Square was opened in 1867 for the Albert Memorial. Statues of John Bright and Bishop James Fraser on the left and right respectively. 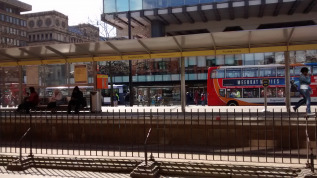 In the centre is a temporary fountain erected in 1894 to celebrate the opening of the Thirlmere Aqueduct, which brings water from the Lake District to Manchester. 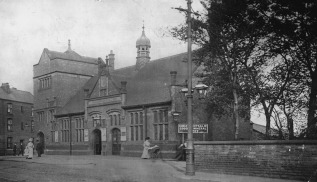 Photo courtesy of Manchester Libraries, Information and Archives.